Wondering what your child is doing at Club Kids while you're getting in a great workout? Here is the June agenda filled with fun activities, crafts, exercises and education for your little one to enjoy and tell you all about! School is letting out and we're kicking off summer at Club Kids this week! Join us for a week filled with summertime crafts, books, exercising and so much more. We will also be testing what sinks and what floats in the water in our sensory & science area. 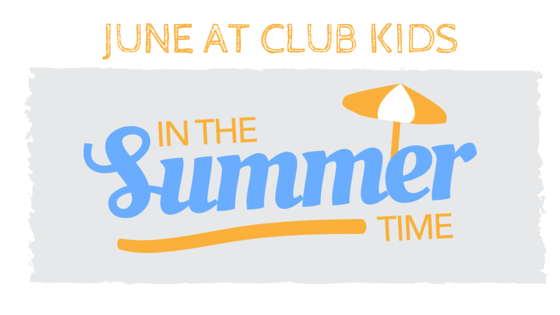 Don't miss out on the official start of summer at Club Kids! "Who needs a super hero when you have a dad?" Club Kids is honoring all those terrific dads out there this week! We will have plenty of Father's Day crafts (which make EXCELLENT gifts!) as well as some "dad-sized" workouts, books about dads and much, much more. We hope to see all your little ones this week while all you dads & moms sneak in a peaceful workout! Bubbles!! One of kids' favorite past times and we will be having lots of fun with them this week! Bring the kids by Club Kids for bubble themed crafts, bubble blowing, bubble popping & lots more fun. Hope to see you! Come on over to Club Kids this week and help us celebrate Independence Day! We have lots of patriotic crafts including the liberty bell, eagles and flags. We will have the sand table out, read lots of fun books and, as always, keep active with some super fun exercises for the little ones! **Reminder, the facility will be closed on Monday, July 4th in observance of Independence Day. Have a safe & relaxing holiday!